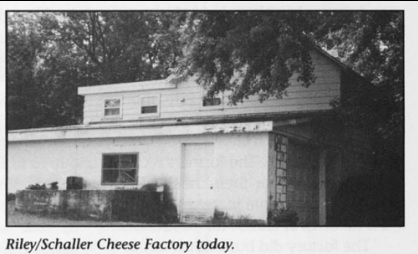 Notes: John Brown (owner of the Riley Store) and Charles Jackett ran a cheese factory at the station in Riley. Matthew Krantz, who bought Charles Jackett's farm near Riley, started this factory there. In the 1920 tax rolls the location was NW COR SE4SW4 in error?, 1912 NW COR NE4NW4 Sec. 1. Biennial report of the Dairy and Food Commissioner of WI: L. Stuessy, mgr. Riley PO 1909, 1913, 1916, 1922, 1930. Also spelled Scheller. Wisconsin Architecture and History Inventory- Architectural Style: Architectural Style: Astylistic Utilitarian Building.